As they say in New Orleans, laissez les bons temps rouler, which means let the good times roll. Mardi gras isn't just one day; it's a season. Mardi Gras season runs from January 6—which marks the Twelfth Night—to Fat Tuesday (aka Mardi Gras Day), which always takes place on the day before Ash Wednesday. Pre-lenten balls and parties were enjoyed by the French of New Orleans as early as the 1700s. Banned by the Spanish in the late 1700s, the celebrations weren't reinstated until 1823, 20 years after the United States assumed ownership. By 1827, the masked balls became legal, and the first documented parade took place in the streets. Food is a great way to celebrate. With the rich Cajun and Creole food culture, there are many dishes to try. Choose from glorious gumbos and jambalayas, dirty rice, po' boy sandwiches, crawfish etouffee, oysters Rockefeller, red beans and rice, bananas foster, pain perdu, and just about anything with a Creole sauce; the possibilities are endless. Whether you're planning a Mardi Gras celebration with friends and family or just want to sample some of the nation's most famous food traditions, you're likely to find something in this list that you will make again and again. Plan your Mardi Gras menu with some of the recipes below, and let the good times roll! One bite of these light, fluffy beignets will transport you to the Cafe du Monde in the French Quarter. Serve the delectable deep-fried pillows with chicory-laced cafe au lait for a classic New Orleans breakfast. Prepare the beignet dough the night before and refrigerate them. All you have to do in the morning is roll them out and drop them in the hot oil. They cook in only 2 to 3 minutes. 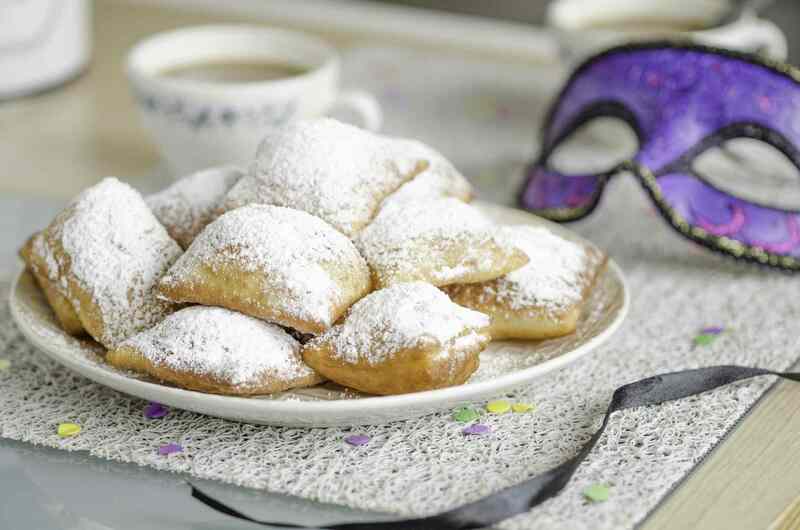 Sprinkle the hot beignets generously with powdered sugar for an authentic New Orleans treat. This shortcut Mardi Gras King cake is not only easy and delicious; it's fun to prepare and decorate. Crescent roll dough triangles are arranged in a circle to create the cake. The filling consists of a sweetened cream cheese filling, and colorful sprinkles or icing provide the signature three-color topping. This version is an excellent choice, especially if you don't have time to make a more labor-intensive brioche cake. The combination of ingredients in this easy jambalaya come together to create a symphony of flavor, color, and texture. Make the chicken and sausage jambalaya as spicy as you like. Serve the dish with crusty French bread and a tossed salad. Cajun-style barbecue shrimp are served with toasted French bread to mop up the delicious buttery sauce. It's typically cooked on the stovetop or in the oven. This version is cooked in a cast iron pan on the grill. The shrimp can be served over hot cooked rice as well. This classic etouffee combines a brown roux with the "holy trinity" of Creole cooking—onion, celery, and bell pepper—along with shrimp and tomatoes. It's an uncomplicated dish with complex flavor. 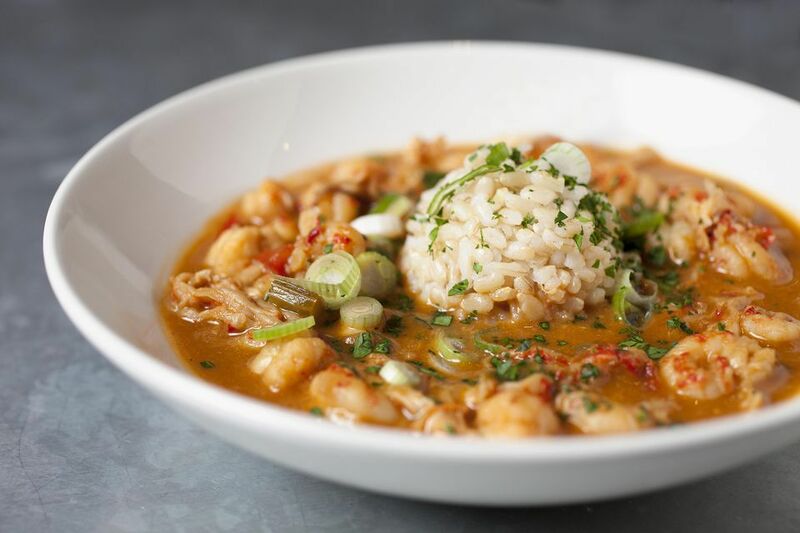 The word etouffee means "smothered," which is a method of cooking that has long been popular in both Cajun and Creole cooking. This chicken version includes chicken breasts, vegetables, and tomatoes. This delicious gumbo contains chicken, spicy sausage, sliced okra, chopped vegetables, and tomatoes. Rice flour is used to make the roux, making the gumbo gluten-free. If you have trouble finding Creole mustard in your neck of the woods, make your own from scratch! The mustard is used on po' boys, in sauces, salad dressings, and in dips. Add it to any dish as a substitute for Dijon or whole grain mustard. This rich shrimp gumbo gets flavor from the spicy andouille sausage, tomatoes, and the "holy trinity" of Cajun and Creole cooking: onion, celery, and bell pepper. Ladle the gumbo over a mound of cooked rice and serve it with crusty New Orleans French bread. If you have vegetarians or vegans on your guest list, this is a great option. The gumbo, made with okra, zucchini, tomatoes, and a variety of vegetables, is seasoned and thickened with file powder. If you're counting calories, this jambalaya is for you. Shrimp, spicy sausage, and tomatoes make up the medley of colors and flavors we've come to expect from Cajun and Creole food. You won't miss those calories! This classic New Orleans bread pudding is finished with a rich and creamy whiskey sauce. Day-old French bread is an excellent choice for this traditional pudding. Add a handful of raisins if you like. This baked bananas Foster French toast casserole is an inventive way to enjoy the famous New Orleans dessert. Serve it for breakfast, a Mardi Gras brunch, or as a dessert. Along with the beignets, creamy brown sugar and pecan pralines are a highlight of any New Orleans visit. They taste as good as they look! The Sazerac is a New Orleans cocktail made with rye whiskey and Absinthe. Use this recipe and tips to make an authentic Sazerac. The muffuletta is a classic New Orleans sandwich made with layers of meat, cheese, and olive salad. The sandwich was created in 1906 by Salvatore Lupo, owner of Central Grocery Co. on Decatur Street. The signature olive salad is made with chopped olives and giardiniera vegetables. Slather some of this grill-ready Cajun barbecue sauce on your ribs, chops, or chicken and get a taste of Louisiana. The tart, spicy sauce features a wide variety of spices and seasonings. Here's a creative way to enjoy Cajun dirty rice. The dirty rice is a combination of rice, minced cooked chicken livers, pine nuts, and seasonings. Boneless chicken breasts or thighs are stuffed with the savory dirty rice mixture. What Will You Be Eating for Mardi Gras? Which Wines Pair Best With the Signature Foods of Mardi Gras?